James Fisk was an American Financier, stock broker, and entrepreneur who is known for being one of the most notorious “robber barons” of his era. Fisk started off his career managing army contracts during the Civil War for Jordan Marsh , and Co., associates a mercantile firm in Boston. During this time period, Fisk was able accumulate much of his wealth through smuggling southern cotton through the Union blockade and selling Confederate bonds. He was also able to generate wealth through dealing with cotton in years after the CivIl War in the Reconstruction Era. Fisk also was a dry-goods salesman for a number of years, and used his experience in accounting and business to speculate and trade on Wall Street. In 1866, Fisk formed the Fisk and Belden brokerage form with support and assistance from financier Daniel Drew. In 1867, Fisk would ally himself with Gould and Drew in protecting control of Erie railroad from tycoon Cornelius Vanderbilt. He also would collude with Gould and Drew in issuing fraudulent stock of the railroad in the “Erie War”. Fisk was comptroller of Erie railroad, and would be named to the board of directors. Fisk and Gould would carry out a series of corrupt financial schemes to their benefit, such as the September 1869 Black Friday scheme in which they attempted to corner the gold market. “Jubilee Jim” which would later become the nickname of Fisk, spent a lot of his wealth on New York nightlife. He would purchase a few opera houses and theaters in New York, including the Grand Opera House. 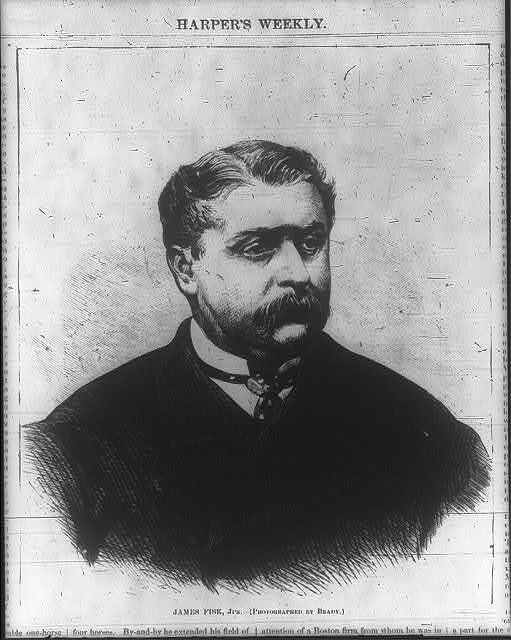 Fisk would also follow in the footsteps of peers such as Gould, in forming relationships with Boss Tweed and Tammany Hall. On January 6, 1872 Fisk was assassinated by an former associate, over his ex-lover Josie Mansfield. The legacy of James Fisk is one of a corrupt Gilded Age “robber baron” who was closely associated with other shady financiers like Jay Gould. Fisk used bribery to manipulate U.S government officials and unethical business schemes and practices to influence powerful economic institutions, such as Wall Street. “Wall Street has ruined me, and Wall Street shall pay for it.” (195).